← Can a patent expire before it issues? A new Supreme Court decision helps to clarify the extent to which copyright law can protect design elements of a useful article, such as an article of clothing. the element would qualify as a protectable pictorial, graphic or sculptural work if imagined separately from the article of clothing (or other useful article). 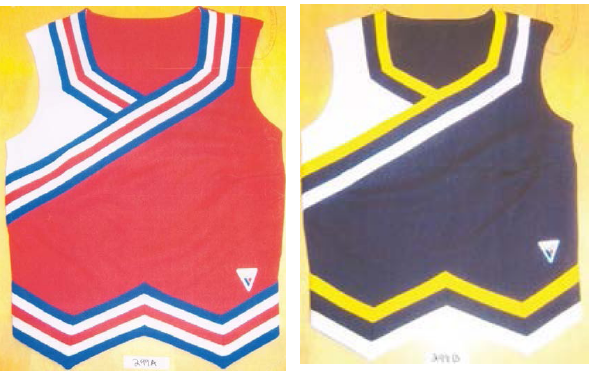 The Star Athletica case involved certain design elements of cheerleader uniforms, such as arrangements of lines, chevrons and colorful shapes. The designs shown above are two examples that the Court considered in the case. The Court noted that for an element to qualify as a copyrightable work on its own, the element “cannot itself be a useful article.” Looking at the designs shown above, the Court characterized the arrangement of colors, shapes, stripes and chevrons as “surface decorations” that could be applied to another medium such as a painter’s canvas. The Court also discussed the example of “a design etched or painted into the surface of a guitar,” which could be replicated on an album cover and even replicate the shape of a guitar. The Court explained that such a design is eligible for copyright because the album cover would not replicate the guitar as a useful article. Thus, the Court distinguished the work of art from the medium to which it is applied. With respect to uniforms, the Court noted that “the only feature of the cheerleading uniform eligible for a copyright in this case is the two-dimensional work of art fixed in the tangible medium of the uniform fabric.” In contrast, the Court explained that copyright does not “prohibit any person from manufacturing a cheerleading uniform of identical shape, cut and dimensions.” In other words, copyright protects a “surface design” but may not protect the surface on which the design is placed. This entry was posted in Copyrights and tagged clothing copyright, Star Athletica v. Varsity Brands, uniform copyright. Bookmark the permalink.